Ship with the most trusted carriers and get exclusive discounts. Choosing the right shipping service is key to delivering a great customer experience at the best possible price. Discover the wide range of convenient options and special discounts available to eBay sellers. 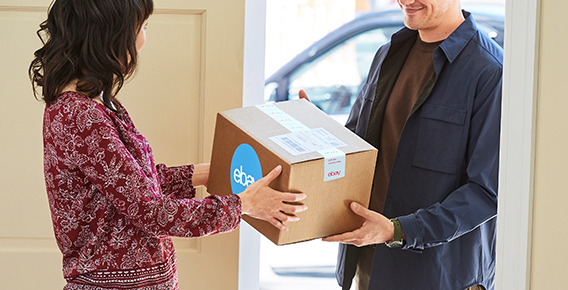 *Top Rated Sellers who have average more than 300 packages per month and use eBay labels for postage, will receive $100 worth of insurance on USPS Priority Mail at no additional cost. Just click, print, and ship to save! Streamline your shipping with the one convenient tool that lets you do it all. What countries can I ship to using FedEx international labels on eBay? FedEx international labels on eBay are currently available to US sellers shipping to Canada, The United Kingdom (England, Scotland, Wales), Australia, Ireland and New Zealand. If you wish to ship to a country not currently available with FedEx international, we suggest you use USPS labels on eBay or the Global Shipping Program which takes care of all the details of international shipping for you—including providing end-to-end tracking and completing all customs forms. My shipment was lost or damaged during transit. What should I do? To file a claim for items lost or damaged during transit, call 1 800 GoFedEx (1-800-463-3339). FedEx must receive notice of a claim due to damage (visible or concealed), delay (including spoilage claims), or shortage within 21 calendar days after delivery of the shipment. Can I purchase insurance for my FedEx international shipment? FedEx provides a complimentary declared value amount of up to $100.00 for any shipments lost or damaged during transit. You may choose to increase this amount during the label generation process. This additional amount will be shown as you create the label and will appear on your monthly eBay statement. What should I do to handle duties and tax disputes with a buyer? What is FedEx SmartPost®? How does it work? FedEx SmartPost is a low-cost service for lower-value, non-time-sensitive packages. FedEx SmartPost utilizes the FedEx network to move packages into the delivery zone before handing off to the United States Postal Service (USPS) close to the destination address for the “final mile” of delivery. The service reduces transit times, minimizes package handling, and leads to cost savings for customers. Does FedEx SmartPost provide insurance for packages? No. FedEx SmartPost shall be responsible, up to a maximum value per package of $100 plus transportation costs, for damage to packages from the time packages are first scanned by FedEx until packages have been tendered for delivery to a USPS facility. FedEx SmartPost is not liable for damages to a package once it has entered the USPS network. Does FedEx SmartPost ship internationally? No. FedEx SmartPost is a domestic-based U.S. service, serving all 50 states and U.S. territories. I just printed a FedEx SmartPost label. Where can I bring my package for shipment? FedEx SmartPost packages should be dropped off at FedEx authorized locations, including FedEx Office. Do not drop off FedEx SmartPost packages at street-corner FedEx boxes. These corner boxes are utilized for Express shipments only. Additionally, FedEx SmartPost packages may not be dropped off at the U.S. Post Office, or picked up by your local mail person. Can I schedule a pickup of my FedEx SmartPost shipments at my home or office? No. FedEx SmartPost labels created on eBay do not qualify for scheduled pickups. How should I package my FedEx SmartPost package? FedEx SmartPost only supports a seller's own packaging for shipping. FedEx or USPS branded boxes are not allowed to be used with FedEx SmartPost. My package arrived later than the average ship time. Can I get a refund? If your package arrives later than expected, a refund will not be due. How do I file a claim with FedEx SmartPost? A FedEx SmartPost claim must be filed through a form on My eBay, accessible after you have printed a FedEx SmartPost label. From the shipping labels section of My eBay, you can manage labels you've already printed, including accessing the FedEx SmartPost claims form. What are the rules for filing a claim with FedEx SmartPost? Claims for damage are only potentially valid if the tracking status of your package states, "Damaged, unable to deliver shipment - Please contact shipper/merchant for details." You must wait 20 business days after the most-recent tracking status update before a claim for a lost package can be reviewed. All claims must be filed within 90 days of the package's physical entry into the FedEx system. When a claim is approved, the purchase price (up to $100.00) of the item will automatically be credited to you on the next monthly eBay invoice. Please note that status updates for pending claims will not be available through eBay or FedEx. I filed a FedEx SmartPost claim — now what? You can expect up to 30 days for claims to be reviewed and processed. Please note that neither eBay nor FedEx will be able to provide status updates during this time. If your claim is approved, it will appear on your invoice the month after which it is approved. Where can I learn more about FedEx shipping and FedEx international shipping services? Please visit the eBay FedEx Shipping Services page. What is Electronic USPS Delivery Confirmation® International (E-USPS DELCON INTL™)For what countries do I get proof of delivery when I ship internationally? Electronic USPS Delivery Confirmation® International (E-USPS DELCON INTL™) is a Delivery Confirmation service included at no charge to select countries. This Delivery Confirmation™ service is available on all First-Class Package International Service™ (FCPIS) items and certain Priority Mail International® Flat Rate Envelopes and Small Flat Rate Priced Boxes. Visit our Help page to see a list of all the available countries. E-USPS DELCON INTL™ is available through eBay labels and E-USPS DELCON INTL™ information will be automatically uploaded to My eBay when you purchase qualifying services through eBay labels. UPS offers great resources on ups.com® to help you with your shipping needs. Visit Getting Started for an overview, including a quick tutorial on UPS marketplace shipping. If you do not want to print your labels on UPS.com, there are several UPS Ready® solutions for eBay sellers to use for printing UPS labels. See the complete list here. What tools are available to help me manage, print shipping labels and track my eBay orders with UPS? Learn more by reading about UPS solutions for eBay sellers. Does the UPS Savings Program for eBay Sellers apply to shipments paid for at The UPS Store®? No. If you are paying for your shipment at The UPS Store, you will be paying UPS Retail Rates. You can still drop off your pre-labeled packages at any one of nearly 4,700 locations of The UPS Store. In addition, The UPS Store Certified Packing Experts® offer full service packing and shipping of your eBay items. Please check to see if your UPS Store offers Certified Packing Expert services. You may also hand your package to a UPS driver at no additional charge or, for a small fee, arrange for a pickup through ups.com or 1.800.PICK.UPS. I've been using PayPal to print my UPS shipping labels. Will I still be able to do this? Yes. You can use any of the UPS Solutions for eBay sellers to print UPS shipping labels. PayPal is one of the options available to eBay sellers. Who is eligible for the UPS Savings Program for eBay Sellers? All US eBay sellers, who do not have a customized shipping agreement with UPS, are eligible to enroll. If you have questions about your eligibility for the UPS Savings Program for eBay Sellers please contact UPS at 1.800.PICK.UPS®. How do I enroll in the UPS Savings Program for eBay Sellers? Visit www.ups.com/ebaysellersavings. Either open a new UPS account, or link your existing UPS account following the instructions on screen. Receive a confirmation email that your UPS account is now linked to the UPS Savings Program for eBay Sellers. How long does it take to get the discounts? After enrolling via www.ups.com/ebaysellersavings you will immediately receive an email confirmation with the date when your new discounts will be applied to your account. How do I get the largest discount? The discounts you will receive depend on how much you ship with UPS. The more you ship, the more you save. Full details on the rates available to you under the UPS Savings Program for eBay Sellers can be found here: See how much you can save. I already receive discounts with my existing UPS account — Can I move into the UPS Savings Program for eBay Sellers? If you have a customized shipping agreement with UPS on your existing account, you will be informed if you have conflicting discounts during the enrollment process, and in most cases you can compare the discounts and choose which program best fits your needs. Contact your UPS representative if you'd like to be moved from your existing customized agreement to the UPS Savings Program for eBay Sellers. What rates appear in the eBay Shipping calculator? If you follow the steps above, buyers will now see the first level of discounts available through the UPS Savings Program for eBay Sellers when you list with Calculated or Actual Cost shipping options in your listings. Can I opt out of the UPS Savings Program for eBay Sellers? Yes. Just call 1-800-PICK-UPS and ask to have your UPS account(s) removed from the program.